This book salutes the achievements of RAF pilots seconded to the Glider Pilot Regiment in 1944/45 to replace the large number lost by the regiment during the ill-fated Operation Market-Garden at Arnhem in Holland in September 1944. Despite their misgivings, they went on to play a crucial role in the largest airborne operation of World War II, Operation Varsity, the crossing of the Rhine on 24th March 1945. The significant part played by this large RAF contingent has been largely overlooked by historians to date and it is hoped that this book will go some way towards making up for this oversight. Produced in a large format with many photographs, this impressive piece of work sets the scene for Operation Varsity in its early chapters by taking in the entire history of military gliders and their development and use by both sides during World War II, leading up to their mass deployment by the Allies in the latter stages of the war in Europe. 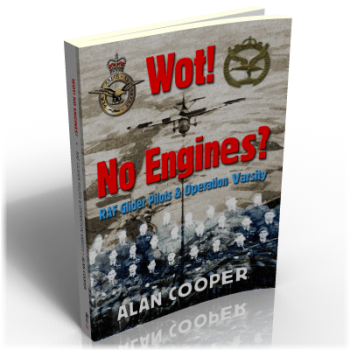 The following chapters feature first-hand accounts from dozens of veterans of Varsity, including many glider and tug pilots plus some of the personnel they carried. Between them they paint a fascinating and accurate picture of what it was like to train for and fly with the largest ever airborne armada in history and then to land in the midst of a battle zone under intense enemy fire. Many men were killed or wounded. The RAF pilots of Operation Varsity have every right to be proud of their contribution to the final chapter of World War II and this book does an excellent and thorough job in recording their names and deeds for posterity, including a full ‘roll of honour’ and many facts, figures and statistics about the aircraft and the men who flew in them.